Ann Arbor–based Sift Studio and EADO are two of a handful of young firms experimenting with material, surface, and meaning. With the help of adventurous clients, they have been able to translate their work from research in the shops at Taubman College of Architecture and Urban Planning at the University of Michigan into sparkling spaces of tactile experience. 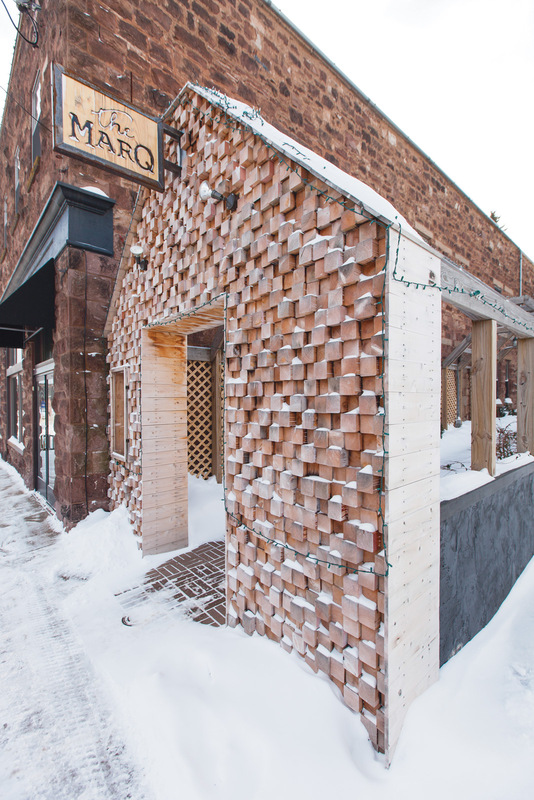 The Marq, a gastropub in Marquette, Michigan, on the northern coast of the Upper Peninsula, is detailed in uncanny materials that blur the line between artificial and natural. The collaboration between EADO and Sift , the Marq is an answer to how theoretical work can play out in real life. The result is a warm, textured space that is at once like nothing else in the small, out-of-the-way town, while still reminiscent of a cozy cabin. 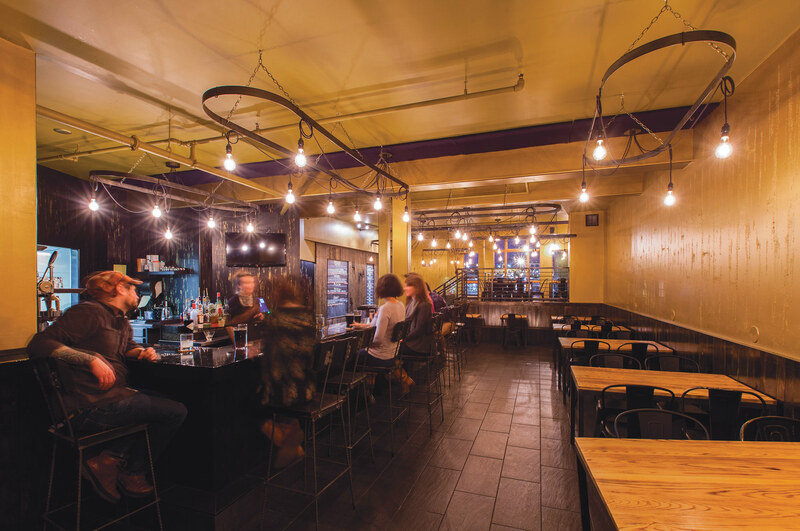 Only steps away from the frigid shores of Lake Superior, the glowing restaurant is a stark contrast to the oft-blowing snow and cold of the Upper Peninsula. 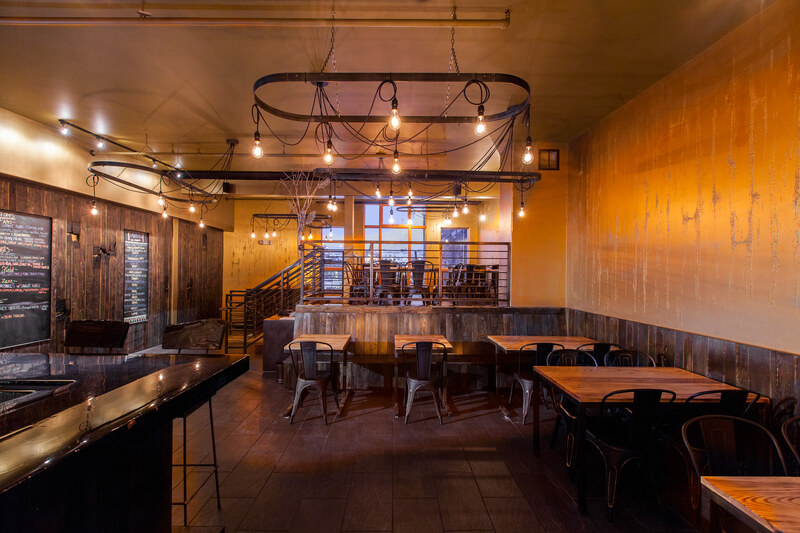 Entering through a door at the end of a set-back walkway, one ascends into the main bar and dining space, completing the separation from the elements outside. 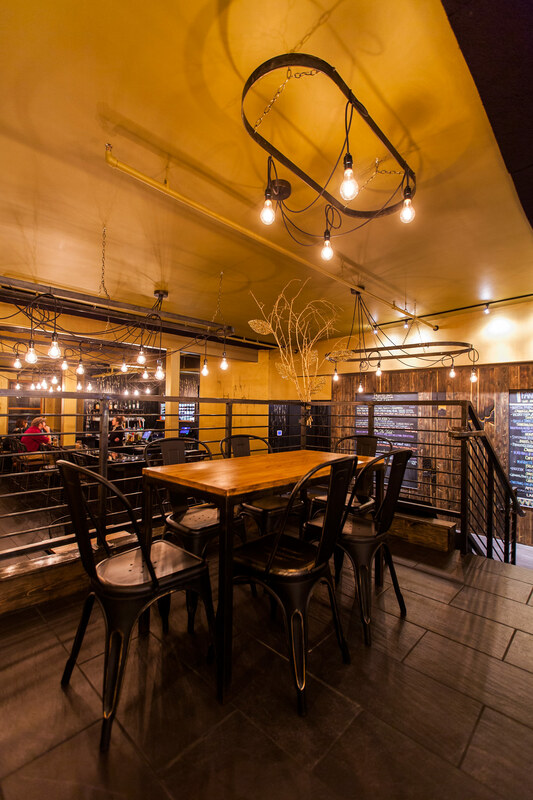 A more intimate seating area, featuring views over the hilly town, is lofted over the entrance. In this spot, the large custom light fixtures become more apparent. Bare-filament incandescent bulbs amplify the effect of the rich gold paint that covers most of the walls. A technique dubbed by the team as “textural grafting” was used throughout the project, in which natural materials are de-familiarized through the application of paint, plastics, and resin—not everything is exactly as it seems. 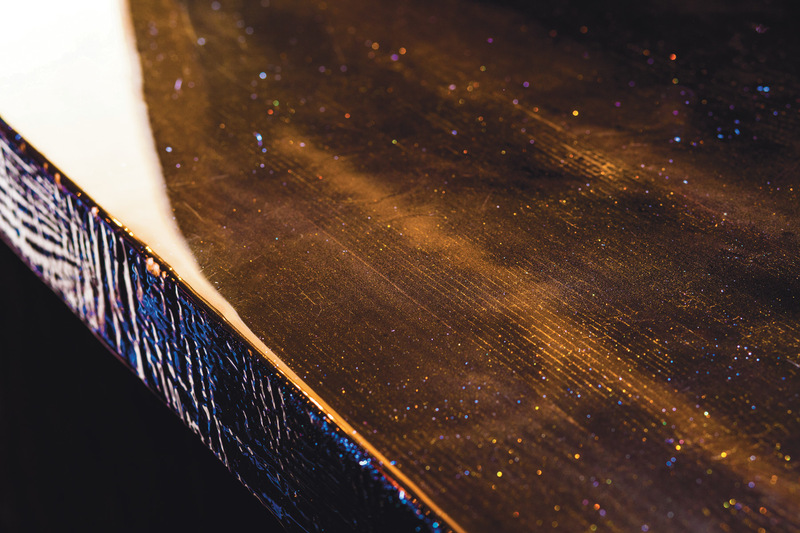 This plays out on the walls, bar, and furniture in the form of gold, glitter, and burnt lumber. The walls are patterned through the use of gloss on matte-gold paint. The pattern itself is derived from abstracted photographs of natural materials; this gives the walls a shiny artificial grain, a grafted texture. 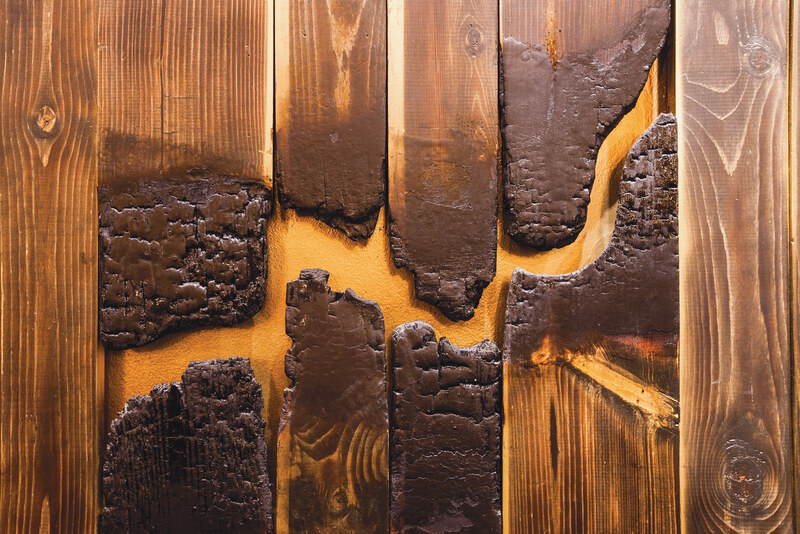 Nearby, a wooden wall is periodically interrupted by absences of material, an effect produced by the burning and charring of the lumbers’ ends, revealing another underlying gold surface. 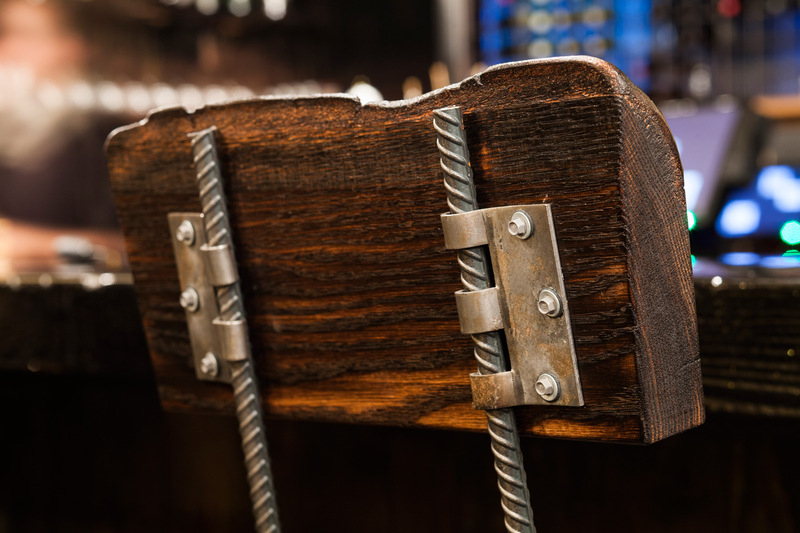 The wood itself is treated with a finish that gives it a smoothness that plays with the perception of the burnt ends, which are smooth and shiny. Another step farther in, the long bar to the rear is first perceived as a simple, slick black material. On closer inspection, its materiality is put into question. While it appears as a monolithic mass, the saturated, thick finish produces a false effect of depth or wetness. 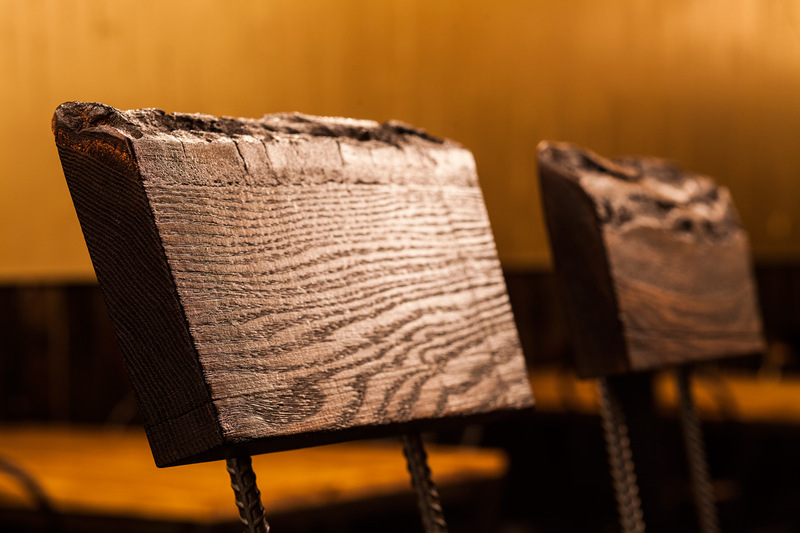 This effect comes from the base material of wood, blackened by charring; its trick texture comes from a thick layer of resin. Glitter, suspended in the resin, sparkles in the low, luminous light of the space, completing the look. a critical practice that is also economically viable. In the case of the Marq, EADO and Sift were able enact practical investigations in the interest of reclaiming some architectural agency for texture and ornament. Correction: In the original printing of this article in AN Interior #3, it was stated that Adam Fure and Ellie Abrons were members of Sift Studio. The project was, in fact, a collaboration between Sift, headed by Adam Fure, and EADO, headed by Ellie Abrons, which are separate studios. This article has been edited to reflect that.